We propose a J-selective quantitative distortionless enhancement by polarization transfer (J-selective QDEPT) 13C NMR method with enhanced sensitivity for accurate determination of the fatty acid compositions of edible oils. The J-selective QDEPT protocol is developed by targeted optimization of the known Q-DEPT+ experiment. Based on the one-bond C-H J-coupling constants (1JCH) which can be measured with the heteronuclear two-dimensional J-resolved 13C NMR spectrum, it is possible to optimize the polarization transfer delay Δ and the reading pulse angle ⊖, thus enabling the QDEPT experiment further enhancing 13C resonance signals which have narrow 1JCH ranges over the traditional untargeted Q-DEPT. 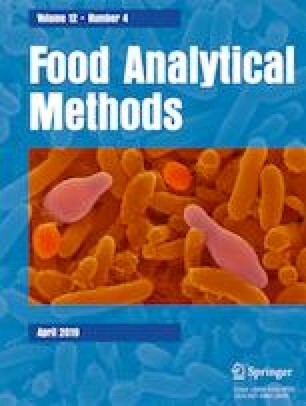 For edible oil applications, it is demonstrated that this procedure brings a 2.2 enhancement factor against 1.3 of the traditional untargeted Q-DEPT compared to the standard inverse-gated 13C experiment, even with a shorter relaxation delay for the two QDEPT experiments. Another advantage of J-selective QDEPT is that a smaller number of quantitative scans are needed to reach a uniform enhancement for different CHn (n = 1, 2, 3) groups. These features of the J-selective QDEPT are particularly attractive for batch analysis in the food industry. The online version of this article ( https://doi.org/10.1007/s12161-019-01432-8) contains supplementary material, which is available to authorized users. The authors would like to thank the Steady High Magnetic Field Facilities (High Magnetic Field Laboratory, Chinese Academy of Sciences, Hefei, China) for performing the NMR experiments. This work was supported by the Ministry of Science and Technology of China (grant nos. 2016YFA0400901 and 2017YFA0505400), the National Natural Science Foundation of China (grant nos. U1532269 and 21675170), and the Major/Innovative Program of Development Foundation of Hefei Center for Physical Science and Technology (grant no. 2017FXZY004). Yunyan Li declares that she has no conflict of interest. Wenping Mao declares that he has no conflict of interest. Chaoyang Liu declares that he has no conflict of interest. Xu Zhang declares that he has no conflict of interest. Junfeng Wang declares that he has no conflict of interest.